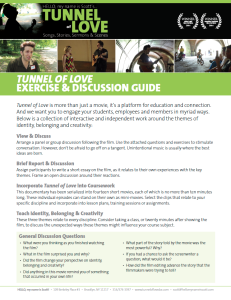 Tunnel of Love is about the intersection of identity, belonging and creativity. But it's more than just a movie, it's a platform for education and connection. We're pleased to offer many resources created for educators, learning institutions, companies, congregations and other organizations to help spread the messages of identity, belonging and creativity. All of these resources are completely free of charge to you. If you and your organization find joy and value and inspiration in this educational component of the project, please consider supporting with a one-time donation, either digitally or through the mail. Thanks! *Your information will never be shared, spammed or sold.